Weston’s wannaB inn has it all. Located on the tip of Manasota Key, just moments from Stump Pass, you can leave our docks and fish the Gulf of Mexico or the beautiful backwaters of Lemon Bay. 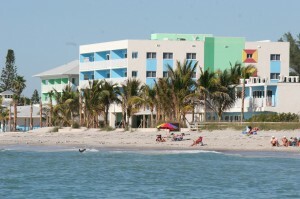 Our resort is located on five acres with docks on the bay side and 900 feet of pristine beach on the gulf side. Weston’s wannaB inn boasts 81 rooms in 7 uniquely named areas. Throughout the resort we have a variety of room styles including efficiency, 1, 2, and 3 bedroom units. All rooms are outfitted with a full kitchen and are decorated with retro-styled furnishings. Nestled between the Gulf of Mexico and Lemon Bay on Manasota Key, most rooms offer incredible views of the Gulf or peaceful Lemon Bay. Boaters love our docks and the easy access to the Gulf. The grounds have recently been completely redesigned with new hard-scaping and landscaping. The two pools on the property have also been upgraded and the boat docks have been rebuilt.